The lemniscate tableau of the 22 trump cards (the Major Arcana) seems to be more for contemplation than for divination. In this tableau, complementary relationships appear when the cards are sorted and laid in a “figure 8” pattern (or a large circle with a twist). 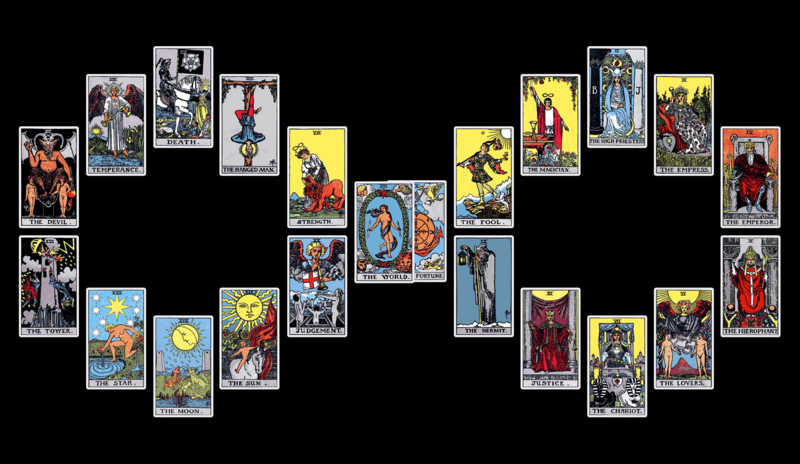 Compare pairs of cards that lie across from each other — for example, The Fool and Judgment, The High Priestess and The Moon, The Empress and The Star, The Emperor and The Tower, The Hierophant and The Devil, The Lovers and Temperance, Justice and The Hanged Man, and The Wheel of Fortune and The World. The Lemniscate Tableau appears in the frontispiece of Alfred Douglas’ book The Tarot, illustrated by David Sheridan. Transformational Tarot — The Lemniscate Tableau. Note: For comparisons between decks, among other reasons, this Web site swaps the positions of Justice and Strength cards in a few modern decks to match the order in older decks.